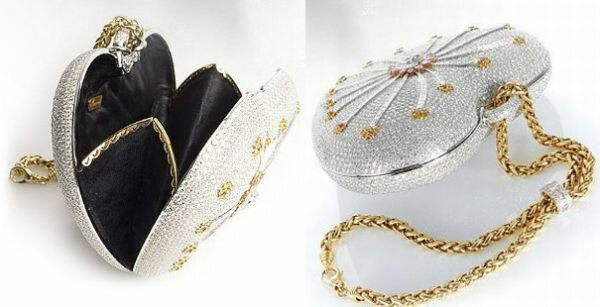 The Guinness Book of World Records has named this purse as the most expensive in the world. It's the 1001 Nights Diamond Purse by House of Mouawad. This handbag is valued at $3.8 million and is covered with 381 carats of diamonds; yellow, pink and colorless. In total 4,517 diamonds were used in making it and it took over 1100 hours to create this bag. Mouawad also holds the record for most expensive bras when the house collaborated with Victoria Secret. They created the collection of fantasy bras valued at up to $12 million. Mouawad is known for luxury jewelry since the late 1800's so this handbag is no surprise. With jewelry that often appears on the red carpet worn by such stars as Jennifer Lopez, Faith Hill and Paris Hilton, it wasn't a challenge to create something so extravagant.